Every year, All Star is obligated to find and retain freelance videographers to have on our team. These freelancers are critical for our continued success in serving multiple clients throughout each season. Generally, we like to have 6-10 freelancers available to work on-call. This means that whenever we have a video shoot come up, if one of our staff videographers cannot make the event, we will call a freelancer in to shoot. 75% of freelancers from this list have worked with us over a period of a few years, and know how to handle just about every video shoot we get hired for. The other 25% of freelancers we hire have to be trained to work in the field for us. Most people in this group have had some type of sports videography experience, but need to know certain details on how to shoot specific games and events. For instance, how we want them to focus on our athletes (in terms of the video they shoot), what kind of equipment they must use, and where we want them to position themselves to capture certain shots. One other minor thing we teach is how they should talk to clients at the shoot site. Our freelancers range from college students all the way to professional freelance videographers looking for more work opportunities. If the videographer already has some type of formal training and displays extensive knowledge and experience in videography, we will not have them go through our formal training. If an aspiring videographer does not have much experience with shooting in the field or experience with certain equipment, we send those individuals through our formal training. One amazing thing we get to see is all of the different styles of filming our freelancers have. We see certain nuances and details that make their work very enjoyable to behold. For videographers just breaking into the field, we teach them to become better videographers and we get to see the progression of their talent. Everyone has a different “eye” for videography, and we see those unique characteristics of each person we hire. 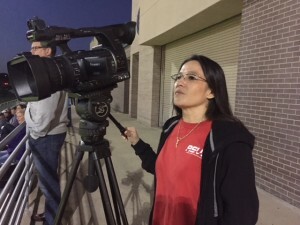 It is safe to say, our freelancer videographers play a critical role in the success of All Star Video Sports.